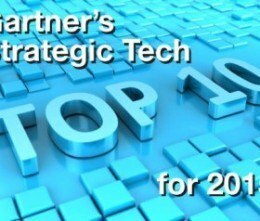 Gartner’s top 10 strategy technology trends for 2015 have the potential for significant impact on organisations in the next three years. Factors that denote significant impact include a high potential for disruption to the organisation, end users or IT, the need for a major investment, or the risk of being late to adopt. These technologies impact the organisation’s long-term plans, programs and initiatives. The trends cover three themes: the merging of the real and virtual worlds, the advent of intelligence everywhere, and the technology impact of the digital business shift.